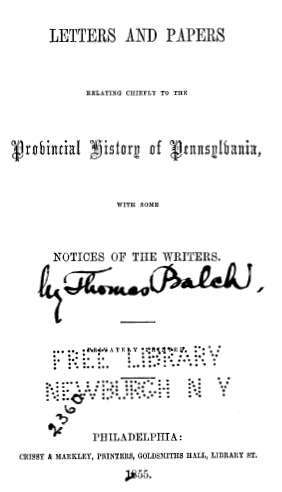 The book, "Letters and Papers Relating to the Provincial History of Pennsylvania with some Notices of the Writers," by Thomas Balch, Philadelphia, Pennsylvania, 1855. This is a wonderful book that is composed of two sections; the first part of the book is a genealogical analysis of the primary people who wrote the papers, letters, and documents in the second part. 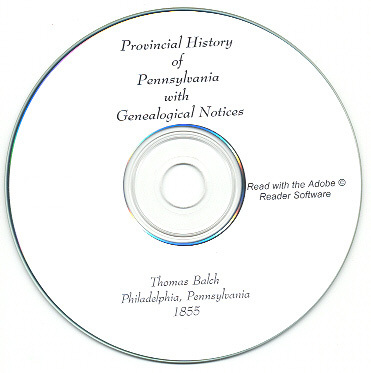 The second part is a collection of papers and letters that illustrate some of the events of the Province of Pennsylvania in the time leading up to (and after) the Revolution. The book has approximately 450 pages. The book is not indexed - but you can search the book using the Adobe Reader 'search' function. Please note: This is not a paper book, it is a scan of the original paper book into the digital Adobe PDF format, written on a CD-ROM. You read this book on your computer using the free Adobe Reader software. It is a digital version of a hard to find book. If you could find a copy of the 1855 printed book, it would be very expensive. The second section contains many letters and papers - including some that provide a list of Officers and men for various groups of military in the 1750's, including the officers and men lost in action near Fort du Quesne on September 14, 1758, the killed & wounded at Loyal Hannon on October 12, 1758, etc. It lists the revolutionary officers & military organizations (1st & 2nd Battalions of the Pennsylvania Regiment ca. 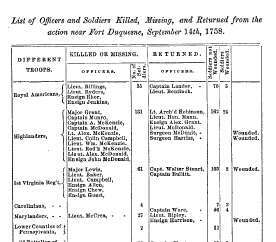 1760), provides records of the 2nd Division, 1st Battalion, of the Royal American Regiment in 1758, and some records of Fort Augusta, Georgia. 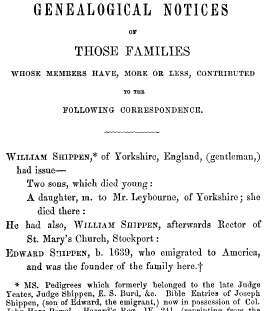 Anne Penn Allen, James Allen, Margaret Allen, Mary Allen, Charles Alleyne, Elizabeth Alleyne, Haynes Gibbes Alleyne, James Holder Alleyne, John Forster Alleyne, John Gay Alleyne, Margaret Alleyne, Sarah Alleyne, Benedict Arnold, Edward Glaburn Arnold, Edward Shippen Arnold, Elizabeth Sophia Arnold, George Arnold, Georgiana Phipps Arnold, James Robertson Arnold, Louisa Russell Arnold, Margaretta Stweart Arnold, Sophia Mathilda Arnold, William Fitch Arnold, William Trail Arnold, & Antonia Arquimba. _____ Bache, Harriet Amelia Bailey, Elizabeth Baker, Thomas Balch, Alexander Baring, Francis Baring, Henry Baring, Caroline Bayard, James A. Bayard, Richard H. Bayard, Maria Benezet, Gilbert Berkley, Alexander Montagu Bingham, Anne Louisa Bingham, Maria Matilda Bingham, William Bingham, Esther Binney, Bordley Black, J. 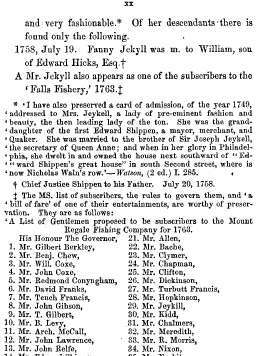 Black, Jane Black, Magdalena Black, William H. H. Black, Rebecca Blackwell, Robert Blackwell, Anna Maria Buckley, Daniel Buckley, Edward Shippen Buckley, M. Brooke Buckley, Edward Burd, Edward Shippen Burd, James Burd, Jane Burd, Joseph Burd, Margaret Burd, Mary Shippen Burd, Sarah Burd, Ann Byrd, Evelyn Byrd, Mary Byrd, Wilhelmina Byrd, & William Byrd. 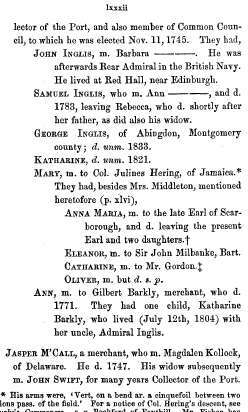 Elizabeth Cadwalader, John Cadwalader, Lambert Cadwalader, Thomas Cadwalader, Benedict Calvert, Caroline Maria Calvert, Charles Calvert, George Calvert, David Carnegie, Elizabeth H. Carrington, Earl Cathcart, _____ Chalmers, _____ Chamberlayne, _____ Chapman, Benjamin Chew, Harriet Clark, John Innes Clark, _____ Clifton, Henry Clymer, Kitty Cochrane, Redman Conyngham, Elizabeth Cooke, Henry S. Cooke, D. W. Coxe, Daniel Coxe, John Coxe, Rebecca Coxe, Sarah Coxe, Tench Coxe, William Coxe, James Craufurd, & C. Cullum. Elizabeth Davis, Charlotte de Vaudreuil, Andrew de Veaux, Augusta de Veaux, Julia de Veaux, _____ Dickinson, _____ Digby, & Robert Dundas. Martha Eddowes, Agnes Elliot, Andrew Elliot, Eleanor Elliot, Elizabeth Elliot, Elizabeth Wallace Evans, Rose Evans, & William Ewing. Thomas Fayerweather, John W. Field, J. Francis Fisher, Joshua Fisher, James Flower, Elizabeth Footman, W. Parker Foulke, Anne Francis, Charles Francis, Elizabeth Powell Francis, John Francis, John B. Francis, Mary Francis, Philip Francis, Rachael Francis, Rebecca Francis, Richard Francis, Samuel Francis, Sophia Francis, Tench Francis, Thomas Willing Francis, Turbutt Francis, Willing Francis, David Franks, & Francina Augustina Frisby. Jane Galloway, John Galloway, John Gibson, T. Gilbert, Nicholas Goldsborough, George Trenchard Goodenough, Susanna Goodenough, Bartlett Goodrich, Virginia Goodrich, Maria Gouverneur, Mary Gray, William Gray, James Greenleaf, Tom Greenough, Abigail Grosse, Thomas Grosse, Charlotte Grote, & Peter Grubb. Jane Halliburton, Charles Willing Hare, George Harrison Hare, John Innes Clark Hare, John P. Hare, John Powell Hare, Lydia Hare, Martha Hare, Richard Hare, Robert Hare, Robert Hertford Hare, Anne Harrison, Mathias Harrison, E. P. Hastings, Ann Hemphill, William Hemsley, Anna Maria Hering, Julines Hering, Harriet Herring, William Herring, William Hicks, _____ Hopkinson, Mary Horsemanden, Jacob Hubley, Edward Hudson, Elizabeth Hudson, Hendrik Hudson, & Edgar Huidekoper. Eleanor Inglis, George Inglis, John Inglis, Katherine Inglis, Mary Inglis, Mary Helen Inglis, & Samuel Inglis. Ann Jackson, Caroline Jackson, Mary Rigal Jackson, William Jackson, Elizabeth James, Martha James, Thomas James, Thomas C. James, James Jauncey, Jr., Fanny Jekyll, John Jekyll, Justus Johnson, & Mary Johnston. Mary Kearney, Judith Kemble, _____ Kidd, & Magdalen Kollock. John Lawrence, Dominick Lea, Jane Lea, Margaret Lea, Margaret Shippen Lea, Robert Lea, Thomas Lea, Frances Leigh, J. B. Lennard, T. B. Lennard, B. Levy, _____ Leybourne, John S. Littell, Harry Walter Livingston, James Duane Livingston, John Swift Livingston, Maria Livingston, Robert Cambridge Livingston, Robert Swift Livingston, Thomas Ferguson Livingston, James Lloyd, T. Lloyd, Elizabeth Lybrand, & Dominick Lynch. James Maitland, Stewart C. Maitland, James Maxwell, Park Maxwell, Robert Maxwell, Dorothy Mayne, Simon Mayne, Anne McCall, Archibald McCall, Catharine McCall, Eleanor McCall, George McCall, James McCall, Jenny McCall, John Searle McCall, Margaret McCall, Mary McCall, Robert McCall, Samuel McCall, William McCall, Katherine Y. McElwee, Edward Bloomfield McIlvaine, Margaret McIlvaine, Maria McIlvaine, William McIlvaine, _____ McMurtrie, _____ Meredith, Elizabeth Middleton, Henry Middleton, Rebecca Mifflin, Samuel Mifflin, John Milbanke, Katherine Barkley Milbanke, Maria Millar, Eliza Moore Moore, Abby Willing Morris, Anthony Morris, Elizabeth Carrington Morris, Luke Morris, Margaretta Hare Morris, R. Morris, Thomas Willing Morris, Thomas J. Mumford, Francis K. Murray, & Mungo Murray. _____ Nesbit, William Newell, William Harmar Newell, & Jane Nixon. Lucy Parke, George Patterson, Robert Patterson, Matthew Pearce, Eliza Peters, Frank Peters, Maria Peters, Nancy Bingham Peters, Richard Peters, Sarah Peters, Pownall Phipps, Philip Physic, Rose Plumley, Sarah Plumley, Anne Plumstead, Catharine Plumstead, Clement Plumstead, Elizabeth Plumstead, George Plumstead, Margaret Plumstead, Mary Plumstead, William Plumstead, De Veaux Powel, Elizabeth Powel, Henry Baring Powel, Hertford Powel, Ida Powel, John Powel, John Hare Powel, Julia Powel, Robert Hare Powel, Samuel Powel, Frederick Prime, & Julius Izard Pringle. John Relfe, Abigail Reynolds, Francis Richardson, Rebecca Richardson, Mary Riche, Robert Ritchie, _____ Ross, Mary Royer, & Elizabeth Cecilia Ruddach. 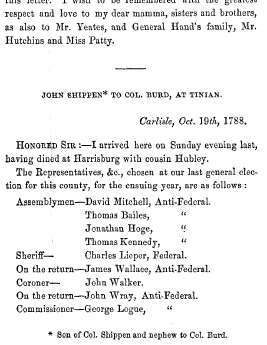 Ann Searle, John Searle, Anna Maria Shippen, Anne Shippen, Beale Bordley Shippen, C. J. Shippen, Edward Shippen, Edward Burd Yeates Shippen, Edwin J. Shippen, Eliza Shippen, Elizabeth Bordley Twiggs Shippen, Ellen Shippen, Evans W. Shippen, Fanny Shippen, Frances Shippen, Frances Stockton Shippen, Franklin Shippen, Hannah Shippen, Harriet Shippen, Harriet Amelia Shippen, Henry Shippen, Jenny Shippen, John Shippen, Joseph Shippen, Joseph Galloway Shippen, Joseph W. Shippen, Kitty Shippen, Margaret Shippen, Mary Shippen, Priscilla Shippen, Robert Shippen, Rose Shippen, Rush R. Shippen, Samuel Swift Shippen, Sarah Shippen, Sarah Burd Shippen, Thompson Shippen, William Shippen, George Smith, _____ Smythe, John Spotswood, C. A. Staples, N. A. Staples, John C. Stevens, Richard Stevens, Andrew Stirling, Anna Stirling, Anne Stirling, C. Dorothea Stirling, Charles Stirling, Dorothy Anne Stirling, Edward Hamilton Stirling, Emma Stirling, Frances Mary Stirling, Harriet Ann Stirling, J. Francis Stirling, John Stirling, Mary Jane Stirling, Mathilda Georgiana Stirling, Thomas Mayne Stirling, W. Frederick Stirling, Walter Stirling, Walter George Stirling, William Stirling, Thomas Story, Frances Stote, Alice Swift, Charles Swift, Edwin Swift, Elizabeth Swift, Ellinor White Swift, Emily Swift, George Swift, Jacob Swift, Jane Swift, John Swift, John White Swift, Joseph Swift, Lewis Swift, Magdalen Peel Swift, Margaret Swift, Martha Swift, Mary Swift, Samuel Swift, Sarah Swift, Thomas Riche Swift, & William Swift. Philip Francis Thomas, Priscilla Thompson, ______Tilghman, Anna Tilghman, Anne Tilghman, Elizabeth Tilghman, James Tilghman, Margaret Tilghman, Matthew Tilghman, Tench Tilghman, _____ Tillinghast, Elizabeth Turbutt, Augusta Chauncy Twiggs, Levi Twiggs, & Priscilla Decatur Twiggs. Anna Francina Vanderheyden, Anna Margaret Vanderheyden, Matthias Vanderheyden, Anna Maria Verplank, & Philip Verplank. J. W. Wallace, _____ Wallen, _____ Watson, John White, Mary White, Peter Wikoff, Alexander Wilcox, Elizabeth Wilcox, Edward Willes, Abigail Willing, Ann Willing, Anne Willing, Charles Willing, Dorothy Willing, Eliza Moore Willing, Elizabeth Willing, Elizabeth G. Willing, George Willing, Harriet Willing, Maria Willing, Mary Willing, Rebecca Willing, Richard Willing, Richard P. Willing, Thomas Willing, Thomas Mayne Willing, & William Shippen Willing. Ann Yeates, & Jasper Yeates.